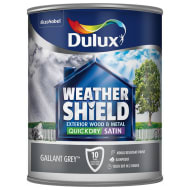 Dulux Weathershield Quick Dry Undercoat. Weathershield Quick Dry Undercoat from Dulux guarantees 10 year weather protection when used with Weathershield Exterior Gloss or Satin. This flexible undercoat is specially formulated for use on wood to resist cracking, providing the perfect base for the top coat gloss. Apply this undercoat from the Dulux Weathershield range exterior metal & wood, using a brush, to prepare the surface for painting. Leave 2-4 hours to dry. Touch dry in 2 hours.